Every ticket has a story, especially ones from your favorite shows. 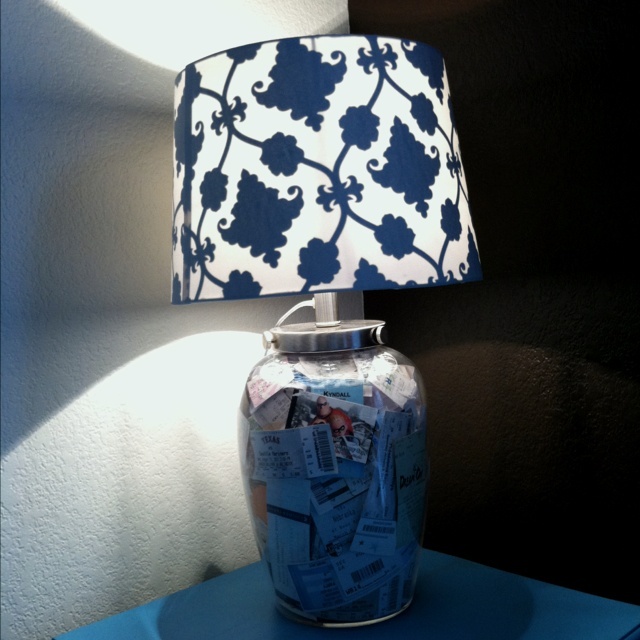 We put together the most creative ways to turn your old stubs into cool experiments! Use paper glaze to cover the ticket and apply super glue to the back of the ticket so it can stick on a magnet, easy as that! Start with a clear lamp base that has an opening and pile them all in, make sure people can read the tickets facing the outside. What you need to do is take a concert ticket to Kinkos (FedEx) and have them blow up the ticket stub on fabric transfer. You can also buy heat transfers yourself at Office Depot, scan the ticket stub yourself and buy a pillow to iron it directly to the pillow! Modge podge is your best friend. Put a layer on a plain frame, stick the tickets on top and add another layer after that. You can either use the same strategy as above using modge podge or you can glue them directly on the wood and place a glass insert over the table. This is perfect to keep track of the 100’s of tickets you have, get creative and add pictures from each show you went to. Then, whip out the book during parties to shows friends! This one will cost money to order, but it is worth it and only $10! Order from TickerCoast. The company will sandwich the ticket between layers of cork-backed board and a clear, heat resistant laminate that both protects your ticket and allows you to show it off. Even though electronic books are the new big thing, it is always great to hold a hard copy in your hand…with a bookmark of course! First, buy laminating pouches from the store and it is easy as ever to frame and then cut them out. Buy or find an empty box frame and slip in all of your tickets! You can even cut a slit at the top so you can add more throughout your life.